The technology of SONIC cleansing has been successfully used for years with toothbrushes. Now, SONIC skin cleansing is available to give you the cleanest and healthiest looking skin every day. SONIC skin cleansing is effective, yet gentle enough to be used in the morning and evening for every age and skin type. The oscillating massage will deep clean your pores and remove impurities, dirt and loose skin cells for a healthier, softer and younger looking skin. NUTRA SONIC for the cleanest skin you’ve ever experienced NUTRA SONIC® is waterproof and can be used in the shower. 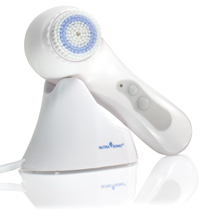 It oscillates with 4 speeds up to 400 times per second and also comes with a very unique "jitter" mode perfect for removing dead skin cells. Oily or dry areas of the skin will be reduced, pores will visibly appear much smaller, and the skin will be free of make up and impurities due to the deep cleansing power of SONIC. I have been wanting to try a face brush for a long time. I hear they get makeup off SO much better then just a wash cloth or tissue. And it actually did give me brilliant results. The charger charges your brush for up to a week, and it's water proof so you can take it in the shower, bathtub, or anywhere you need to clean! I fell in love with my Sonic Toothbrush, now I have fallen in love with my Sonic Face Brush. The speeds include low for sensitive skin, medium for normal skin, pulsating jitter mode for microdermabrasion and high for a body treatment. Comes with easy to read instructions, and there are only two buttons, so there is nothing that is too confusing. I really see a difference in how clean my skin is after using the Nutrasonic Body Brush. It has really evened out my skin tone, and reduced those ugly patches you get sometimes from not removing all the makeup off of your face at night. You can purchase the NutraLuxe Nutra Sonic Brush System on the NutraLuxe website for $150. You can also purchase extra brush heads and other accessories. One lucky reader is going to win the NutraLuxe Sonic Brush System ($150 value) Exciting right? Well in order to win, your gonna have to work for it! To enter, as your mandatory entry, visit NutraLuxe & tell me another product that interests you! +2 "Like" NutraLuxe On Facebook & tell them Bella's Beauty Spot sent you! +1 per day - Tweet about this giveaway you can use "win a nutrasonic cleansing brush ($150) #giveaway http://www.bellasbeautyspot.com/2010/07/nutraluxe-nutra-sonic-spin-brush.html"
+5 Blog about it, must be in it's own post with links to the sponsor and me. NEW! For five extra entries, fan me on facebook! Good luck! Giveaway will end 8/21/2010. Open to the US only. Winner will have 48 hours to respond to the winning email or another winner will be chosen. I received product for the purpose of this review only. All opinions are my own. what a wonderful prize. I would also love to try the puffy eye - dark circle eraser pen. Thanks so much. I "Like" NutraLuxe On Facebook (Margaret E. Smith) & told them that you sent me. I'm in need of the Puffy eye - dark circle eraser pen! They also have a sun-age spot remover pen that I could use. I am into face products more than anything else and I found an Intensive Face Lift Serum that sounds like it might just do the trick! Left a comment on my wall on Facebook regarding the Nutraluxe Sonic Brush giveaway on your blog @mmbear_us. Went on Nutraluxe's Facebook page and became a fan and left comment saying Bella's Beauty Spot had sent me there. I would like to try the Intensive Face Lift. Their COLLagen X-plosion looks great, too. Intensive Face Lift interests me. OHHHH! I've been wanting to try this! This would be wonderful. I also like the Lipo Reduction System. The infrared mAssager kit - Lipo Reduction System looks interesting. I would love to try the Nutaluxe Lash MD. Thanks! i would love to try night rejuvenation. The INTENSIVE FACE LiFt interests me too. Night Recovery Process would be my first choice. The dark circle eraser pen would be just what I need! What a fabulous prize giveaway contest! Email subscriber to Bella's Beauty Spot! I "Like" NutraLuxe on Facebook. that Bella's Beauty Spot sent me! The dark circle eraser pen would be just what I need. This would be an awesome gift to myself! I hope I win this! Thank you! I'm interested in trying the Nutraluxe Lash MD. 1. I'm an email subscriber to BellasBeautyShop. 2. I'm an email subscriber to Bellas Beauty Shop. I like the Nutra Luxe Lash M.D. I would love to try the eye lifting serum too. I would also love to try the Organic Perfect Day moisturizer. Entry #1 --> I am following your blog (username Nelsby). Entry #2 --> I am following your blog (username Nelsby). Entry #1 --> I subscribe to your newsletter. Entry #2 --> I subscribe to your newsletter. Ooh, the Sun Age Spot Remover would be awesome! I'd like to try the Intensive Face lift. dark circle eraser pen...i need! I would also be interested in the Infrared Massager Kit - Lipo Reduction System. After having the baby, I've got a little "bumpy" I suppose is the nice word for it. Exercise doesn't seem to do a lot for cellulite on the thighs. Would love to try this to see if it worked. The sun-age spot remover pen interests me! I'd Iike to try Nutraluxe Lash MD. #1 I follow this blog. #1 I "like" Nutraluxe on FB and told them Bella's Beauty Spot sent me. #2 I "like" Nutraluxe on FB and tol them Bella's Beauty Spot sent me. I tweeted again about this giveaway. This NutraLuxe Nutra sonic Face Brush is an item I have coveted for a long time. I would also like to try puffy eye - dark circle eraser pen. Wonderful contest! Thanks so much. I like the PERFECT DAY MOISTURIZER. The COLLAGEN X-PLOSION also looks wonderful! 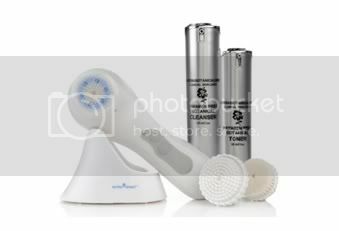 tweeted "win a nutrasonic cleansing brush ($150) #giveaway http://www.bellasbeautyspot.com/2010/07/nutraluxe-nutra-sonic-spin-brush.html"
I'd like to try the Eye Lifting Serum.